The Philadelphia Campaign was a year of battles with the Americans at Valley Forge. 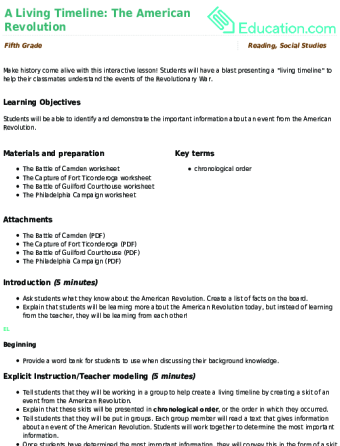 Students will hone reading skills and learn about the American Revolution. This fun and spooky worksheet focuses on sentence editing. Your student will correct all the grammatical errors he finds in the worksheet. 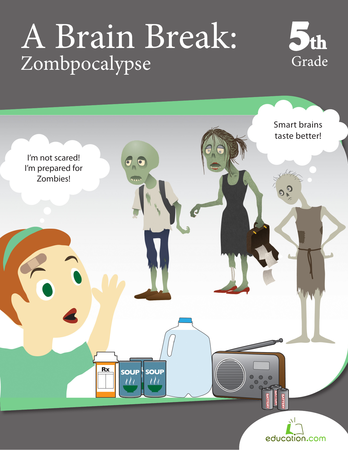 From zombie history to writing prompts and survival preparedness, this mix of zombie-themed worksheets is the perfect treat for kids who need fun brain breaks and supplementary work. Celebrate Chinese New Year by learning about the origin of the Chinese Zodiac with this traditional folktale. Ever wonder why we wear green on St. Patrick's day, or where the leprechaun came from? Find out with this worksheet on St. Patty's Day history! Unwrap the history behind a spooky Halloween favorite: mummies! With this reading worksheet, your child will learn all about mummies. Introduce your child to Ramadan, a holiday celebrated by millions of Muslims around the would, with this informative worksheet. Ever wonder why we hunt for Easter eggs? Discover how this spring holiday was started with this interesting look at the history of Easter. What will you be when you grow up? Have fun reviewing different career words with this word scramble! Do you believe in the Bermuda Triangle? Compare witness accounts of these weird waters and draw your own conclusions in this reading worksheet. Holiday writing prompts are festive and educational for your child. This holiday writing prompt is perfect for the Christmas season. Polish your werewolf story writing this All Hallows Eve. Do some werewolf story writing in this Halloween worksheet. Prompts invite students to consider the meaning behind each amendment to the U.S. Constitution — and to illustrate them as well. A limerick is a silly poem with a certain amount of syllables. This worksheet teaches your little poet how to write a limerick. This fantastically illustrated excerpt of Dr. Jekyll and Mr Hyde, is a surefire way to get your kid in the Halloween spirit. This Frankenstein worksheet is great for teaching kids about classic literature near Halloween. Use this Frankenstein worksheet with your child this October. Make history come alive with this interactive lesson! Students will have a blast presenting a "living timeline" to help their classmates understand the events of the Revolutionary War. Read this excerpt from The Hound of the Baskervilles, then use your Sherlockian skills of observation to identify different character traits. Put yourself in Dracula's shoes -- er, fangs -- and write from his perspective. Put your child's Christmas knowledge to the test with a challenging crossword puzzle all about this fun winter holiday. Children learn about the traditional Chinese Zodiac calendar — then get creative and design a calendar of their own, including a brief description of why they chose each animal. Read about the history of the Winchester Mystery House, and then answer some comprehension questions. Sink your teeth into this fun reading and writing activity, and learn all about vampires! Your child will read some history behind these Halloween villains.